It’s been in Paisley’s collection for two centuries…now a manuscript penned by Robert Burns himself has been confirmed as the world’s only surviving copy of a rare piece of the poet’s work. It was donated to Paisley around 200 years ago, just as Burns relics were becoming valuable commodities, and has been in the town ever since. But the true significance has only now become known – with a leading Burns expert confirming that not only is the script in the bard’s own handwriting, but it is the world’s only known surviving copy of the verse. It will go on display in Paisley Museum this week – in time for the 257th anniversary of Burns’ birth on Monday, and at a time when Paisley’s bid to be UK City of Culture in 2021 is gathering pace. It was originally donated to Paisley by John Clarkson of local threadmakers McGavin and Clarkson, at a time when the town was a thriving global textile hub. 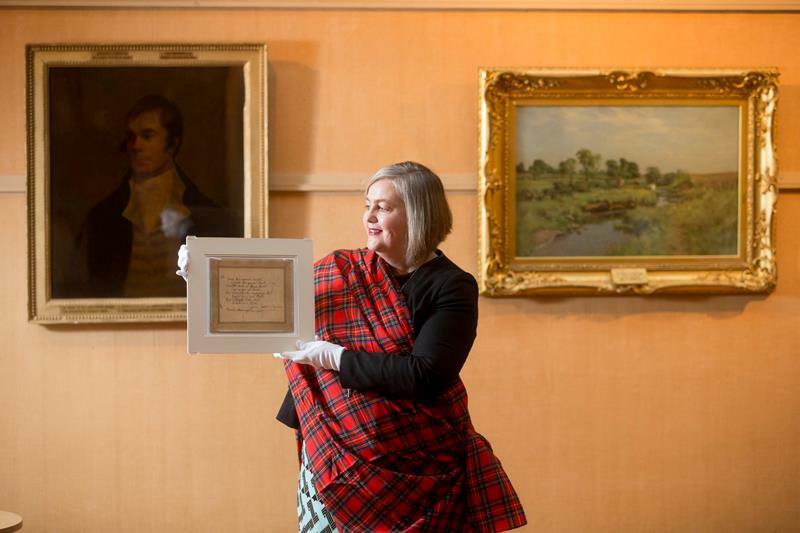 Professor Gerard Carruthers, co-director of the Centre for Robert Burns Studies at the University of Glasgow w- authenticated the piece – said: “Although this is not one of Burns’ major works, it is a hugely important manuscript. “In it he accepts an invitation to a social gathering, even though he says he is at this moment as drunk as ‘Bartie’ – which has been taken as a name for the devil. The item was initially held in the collection of the institutions which later formed the current Paisley Museum and Central Library and has been in secure storage in the town in recent decades. In November last year, plans were revealed for a £56.7m revamp of Paisley Museum into an international-class destination based on the town’s unique textile history as a flagship project connected to the town’s UK City of Culture 2021 bid. At the same time, Renfrewshire Council has set aside £3.7m for a publicly-accessible museum store to open on the town’s High Street by 2017.